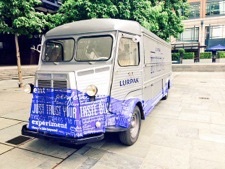 As part of their Freestyle Campaign – Lurpak’s Freestyle Food Truck is travelling to London this summer and will be found at locations around the city. The #FreestyleFood Campaign has been going strong on Twitter with foodies sharing examples of their efforts to try something new for lunch. So if you are in London over the next few weeks check out Lurpak’s Freestyle Food Truck serving up a refreshingly exciting new range of top freestyle sandwiches and crostini style canapés to hungry lunchers absolutely FREE of charge. So contrary to the saying “there is no such thing as a free lunch” Lurpak will be offering Londoners free lunch for an entire month encouraging people to shake up their existing food routine. Let me know if you get along and what you try out!